I attended the press conference today to announce the new Coliseum Management. The Council will approve it at the next meeting. The only problem I saw was a lack of transparency and no Request For Proposal was issued. David Hales said two other companies were in town last week and another one was on the phone. The committee organized to find a replacement for CIAM may have talked to others. Hales claimed that finding a new management company was an emergency. That said, it looks to me like the City has made a GIANT step forward. Judy Markowiz and crew didn’t have the slightest idea what they were doing and taxpayers suffered for 10 years because of it. 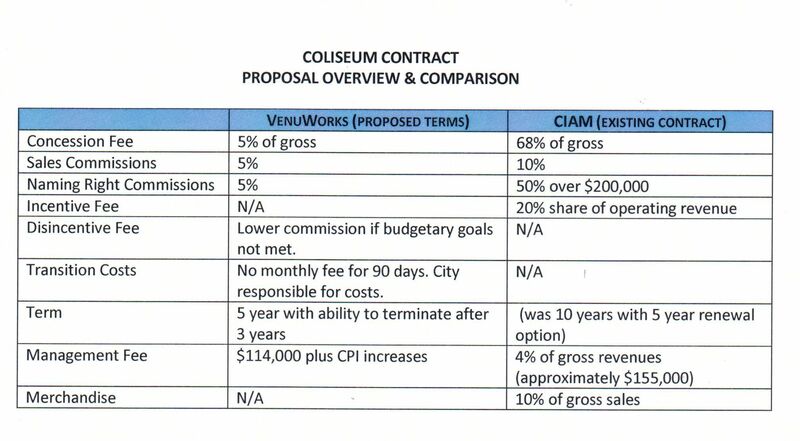 The graphic below sums up the difference between the CIAM contract and what will be the contract with VenuWorks out of Ames Iowa. Professionals will be managing now – a recap of every event will be posted on-line according to City Attorney Jeff Jurgens. Transparency, for a change, is more than welcome. Many Coliseum employees came to the press conference. I know they didn’t see the change as an emergency. I’m sure they are concerned about their jobs, I would be. Maybe the City was worried about John Butler hanging around when his contract expires, and thus considered replacing him a priority. I don’t know if the Coliseum will ever show a profit and pay the loan payments. Predictions before it was built have so far been wildly off. At least now the Coliseum has a chance to perform much better. I also congratulated Hales and Jurgens on what looks like a good move for taxpayers. Tari was hiding from me at the time. Posted in - - - Please Contribute - - -, BloNo, Bloomington, Hales, Local, Renner, Taxes.Tagged CIAM, Coliseum, VenuWorks. Time will tell how well the change affects the financial situation associated with the Coliseum. It will take years to make up for the losses. Apparently many voters do not want to hear this information. But a lot of people are fed up w/ the city and its lying. I thank you for doing the legwork, thinking and reporting that our “newspaper” refuses to do. When did that finally sink in – last week? Kudos to Mr. Hales and staff for teaming with VenuWorks to work to at least get operation of the Coliseum pointed in the right direction. The above numbers show how much the previous management plundered the citizenry. Hope the new arrangement goes well. Keep in mind, this change only came about when the light came on and the cockroaches were forced to scatter. A big tip o’ the hat to Diane “The Flashlight” Benjamin and contributers, and keep up the good work! Honestly I am still of the opinion that this white elephant should still be sold. No city government should be involved in a venture like this as well as hotel development. Private businesses should be doing this. Next up on the podium will be Renner’s goal to get a hotel in the downtown. This needs to be stopped! I wonder if one of the back room head nod conditions was that the city pursue this. It would not surprise me at all. What the heads at city hall don’t seem to get is about the slow local economy and lack of good employment in the area. I wonder how a buyer for Mitsubishi is working out. I know good luck on that. Considering they still owe many millions, nobody is going to buy it. Even if they didn’t, who would buy it? The City needs to stop pouring money into EDC. They are also clueless and not accountable to anyone. A government agency that isn’t accountable to anyone. You all are drinking the Kool-Aid again. Don’t fall for it. This deal is worse than what they had. Let me point this out since nobody is asking the right questions. Their comparison of contract terms sure does look good doesn’t it. Now lets look at it closer. For instance, the concession fee. They tell you that the commission will go from 68% to 5% of gross sales. Wow that is amazing, you all say. This is not an apples to apples comparison though. CIAM paid out 32% to the city off the top as commission, then paid the 10.75 % sales tax which left them roughly 57% to pay for all salaries, wages, expenses, inventory, etc. Not to mention that they purchased all the equipment and had to make payments on that. I can tell you since I know many workers over there that this company struggled to break even. They would have been lucky to profit 1% of sales I bet. They shouldered all the risk and the city got their cut risk free. Now let’s look at the new contract. VenuWorks will receive 5% of gross sales as commission. This means that they even receive commission on the sales tax that has to be paid. The city will have to cover all expenses now. They will cover salaries, wages, expenses, inventory, etc. that CIAM had covered in the past. And yes, the city will have a massive up front cost as they will have to purchase all the equipment. They could buy the used equipment from CIAM or all new equipment which would be a much, much more expensive option. So, under this proposal, Venuworks makes their money risk free while the city takes on all the risk and has to come up with all the capital to fund this venture. Sounds to me that the city got the bad end of this deal. Just my thoughts. Don’t let officials dupe you again. They are not telling you the whole story. Until we see the contract all the details aren’t known. We have no proof CIAM paid anywhere close to 32% – hence my lawsuit. I do know the commission on backstage catering was NEVER paid. The equipment is still not settled, it’s 10 years old and fully depreciated, so either the City shouldn’t buy it or it should be dirt cheap. The City had to cover the massive losses before, so having to fund expenses may not be that much different. Professional management has to make a difference, plus managers with connections with all the other arenas they manage. Booking acts should be easier, only time will tell. We’ve been promised transparency and that’s a HUGE improvement. Maybe audited statements won’t be hundred’s of thousands of dollars worse than what the management reported. The media happily reported CIAM’s numbers instead of the audit. I see your concerns. We have to let it play out and see what happens.